The original painting that was emblazoned over the cover of Lando Calrissian and the Mindharp of Sharu. Back in 1983, when all we knew of Lando Calrissian was The Empire Strikes Back, L. Neil Smith wrote a trio of novels that fleshed out the life of the smooth-talking Baron of Cloud City and took place before we met him in the movies. 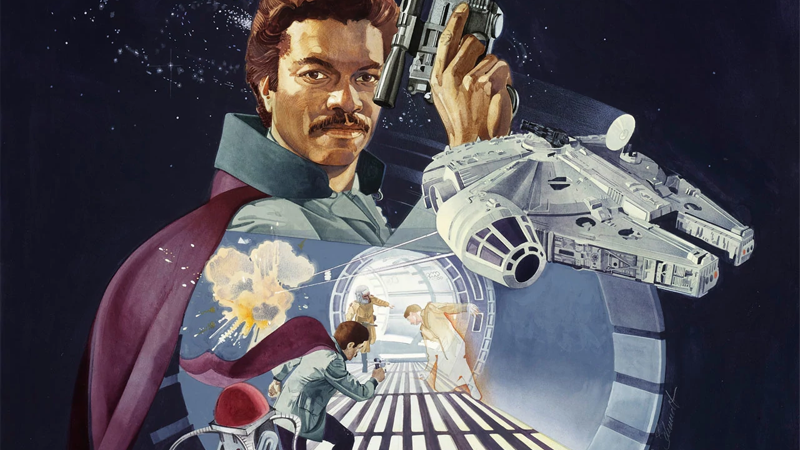 It was a rare chance to get insight into a time when Lando owned the Falcon—something we’ll get a lot more of when Solo: A Star Wars Story lands in a few weeks—but they were also some of the weirdest Star Wars novels around. To celebrate meeting the young Lando of Solo, and given that we’ve already looked at the expanded universe (EU) past of Han himself, we’re taking a weekly look back at each novel in Smith’s Lando Adventures trilogy: the spectacularly named Lando Calrissian and the Mindharp of Sharu, Lando Calrissian and the Flamewind of Oseon, and Lando Calrissian and the Starcave of ThonBoka. Turns out, in the expanded universe, Lando’s early days before he reunited with (and briefly betrayed) Han on Bespin were much, much weirder than him keeping a cape room in the Millennium Falcon and looking suspiciously like Childish Gambino. First up? Mindharp of Sharu, which barely, just barely manages to lean on the “science” part of the “science-fantasy” genre Star Wars usually inhabits. In the Wild West that was the very early days of Star Wars tie-in merchandise, there was so little to go on that the material could be pretty out there—something that’s way more obvious now that we have 40-plus years of lore and storytelling to draw on to find that quintessential Star Wars tone. Mindharp of Sharu that reads more like a fantasy novel that just occasionally happens to have a spaceship in it. And it’s trippy as hell. Set a few years before A New Hope, Mindharp of Sharu sees Lando thrust into a mystical quest to retrieve the titular Mindharp, an artifact from an ancient civilization of mysterious alien beings. This starts to unfold after some card games, in which he wins a droid named Vuffi Raa, lead to him being arrested on phony charges on the planet Rafa IV. The tentacled quadruped droid honestly ends up being a more fascinating character than Lando, simply for the debates around droid sentience that spring up around it. Star Wars is not afraid of being fantastical—it is, after all, a tale about magic-power wielding knights battling each other with laser swords—but Mindharp of Sharu is basically a fantasy novel with a scifi sheen. Its primary villain, Rokur Gepta, is literally a sorcerer (eventually canonized as a Sith Force user but for all intents and purposes here, a straight up wizard), and Lando and Vuffi themselves become wrapped in ancient prophecies that cast them as foreseen figures of legend. The pyramid that the Mindharp has been stored in for thousands of years forms a major part of that weirdness: a multidimensional mind trip that warps time and space within it, granting weird powers while also altering Lando and his compatriots into different sizes on a vast scale as they explore its insides. Eventually it’s even revealed that the Mindharp is a sort of mind-control device, used by the Sharu to wipe their entire species’ brains so they could go into hiding as a more primitive species called the Toka in fear of an ancient threat. It feels unlike anything you’d expect from the Star Wars universe in a way that’s more alien than it is refreshing. Lando finds the aforementioned Mindharp in a painting created for Del Rey’s The Essential Readers Companion. Lando himself is almost as alien to audiences in this novel as the story is itself. Despite the character’s appearance as a rogue-turned-hero in Empire, Smith’s take on Lando is less of that smooth-talking, charmer of an ex-smuggler we meet on Bespin, and more of, well... a goofy, down-on-his-luck jokester with a penchant for really bad puns. Smith’s Lando (aside from, oddly enough, being a bit of a chain smoker) is more likely to crack wise about spacesuits cramping his satin shirts than act the suave way he does in Empire. Hell, he doesn’t even know how to fly the Falcon in this book—his repeated gambling is to pay for repairs caused by his shoddy piloting more than anything else—despite the fact he does so pretty easily in his debut in Empire. But even then, Lando’s frivolous attitude to the bizarre quest he goes on the book is pretty much the grounding point for Mindharp of Sharu as a Star Wars story. Even if he’s barely like the Lando we knew from Empire—or the Lando we know now after years and years of stories—his freewheeling, at-times ludicrously silly attitude acts as a foil to the inherent weirdness of everything around him. 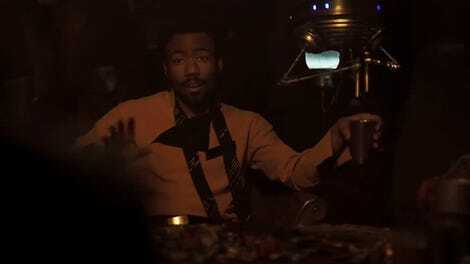 In a way, that kind of does feel like the Lando we know—if this was a Han Solo adventure, the surly smuggler would constantly be snapping at the absurdity of everything going on. Lando just rolls with it and doesn’t care what happens as long as he comes out on top. And really, for all their oddities, combining those two things—a wild hero’s adventure and a protagonist who cares more about cracking silly jokes and finagling his way out of ludicrous situations—makes Mindharp of Sharu strangely charming to read, even in the context of knowing just how foreign its idea of the Star Wars universe is to us in a world where there are new, official Star Wars stories cropping up practically every other week. There’s a goofy fun to its bonkers interpretation of the galaxy far, far away that’s only enhanced by Lando barely giving a thought to what’s unfolding around him. It’s the polar opposite to the self-seriousness of the events we met him in during Empire, a quirky antidote to a grim tale that gets by on its oddness more than through any sense of dramatic weight to its story. In the end, what is actually the most delightfully weird thing about Mindharp of Saru’s legacy isn’t its portrayal of Lando or its fantastical imagining of what a Star Wars adventure could be. It’s sabacc. Smith gets into an absurd amount of detail in the book describing the rules and cards of the game we famously know as the medium through which Lando would lose the Millennium Falcon to Han Solo, down to the cards in a deck or the names of winning hands—names and ideas that still remain in canon to this day, and we’ll be seeing again when Solo recreates that legendary moment in a few weeks’ time. It’s funny to think that, in a novel which otherwise seems to barely even understand either Lando or the Star Wars galaxy at large, tiny details from it have sprung forth and taken root in the franchise all these years later.